Weltraum Philatelie e. V. presents new catalogue on space stamps in full colour. The results of a true herculean effort have been presented by the German space stamp collectors: a catalogue assembling all space stamps ever issued in Europe and Russia. The publication of the catalogue has been sponsored by Weltraum Philatelie e. V., the German association of space stamp and cover collectors. From Albania through Yugoslavia on 456! pages, author Dieter Steinbrecher has assembled, described and scanned all space stamps issued until the end of 2007. This catalog caters for the needs of collectors who wish to collect, sort or exhibit space and astronomy stamps, Steinbrecher explains. He uses the numbering system of the German Michel catalogue. However, no values are given. The giant effort doesn't even end there: in the years to come, Weltraum Philatelie intends to add volumes 2 to 5 to their catalogue, assembling the space stamps issued on other continents. Dipl.-Ing. 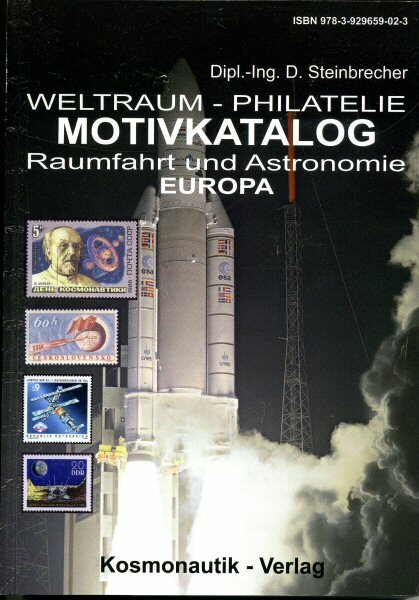 D. Steinbrecher, Weltraum Philatelie Motivkatalog Raumfahrt und Astronomie, Europa, 446 Seiten, ISBN 978-3-929659-02-3, Kosmonautik-Verlag, Sinzig. Price per copy: 55 Euro plus postage. A CD-Rom of the catalogue (pdf) is available for 20 Euro + postage. Payment can be made by bank draft, cash payment or through Paypal.